Prince and DeVos, like Trump, use their wealth to exert political influence and advance ideological visions that are harmful to U.S. democracy and institutions. The Prince-DeVos family is yet another example of Trump bringing in wealthy friends to corrupt the foundations of American public life. In early March, The Washington Post reported that Mueller was investigating a secret meeting that Prince had with a close friend of the Kremlin to establish an unofficial line of communication just weeks before Trump’s presidential inauguration. Prince appears to have lied about this meeting when he was questioned by the House Intelligence Committee in November 2017, claiming that his interaction with the Russian proxy was nothing more than an impromptu conversation while he was traveling as a private citizen. While the purpose of the interaction is unclear, it is likely that Prince participated in the meeting to gain political capital to build support for one of his political priorities: transferring part of the military to private, unaccountable hands. Prince, who founded private military services company Blackwater Worldwide and now runs the Africa-focused security company Frontier Services Group, is under investigation by the U.S. Justice Department and other federal agencies for attempting to broker mercenary deals with foreign countries. Prince is also currently laying the groundwork to further privatize parts of the U.S. military. In a 2017 Wall Street Journal editorial, Prince calls for the appointment of one person, “an American viceroy,” to direct and oversee the efforts of the U.S. government and supporting coalitions in Afghanistan—similar to how Gen. Douglas MacArthur, who served as the supreme commander of the Allied powers, led Japan in the aftermath of World War II to orchestrate a new Japanese government and eliminate the country as a threat for another war. To support this viceroy, Prince has proposed creating a private paramilitary force comprised of local men, modeled after the British East India Company’s control of India in the 18th century —replacing professional soldiers with what are essentially mercenaries. According to Prince, the United States’ current military involvement in Afghanistan is too costly and inefficient due to the burdensome need to adhere to rule of law and military supervision. Prince’s proposal would upend traditional U.S. military operations and bring the nation back into the role of an openly imperial power. Sean McFate, a foreign policy and military expert, warns against the plan. Centuries of imperial projects motivated by the quest for wealth show that this strategy has caused more problems than it has fixed. Rationally, McFate worries that on such a large scale, these mercenaries would become “products on an eBay of war”—and the United States could soon find itself competing with other superpowers to control them. According to him, this plan really only has deep appeal for “a new breed of conflict-entrepreneur[s].” In a 2017 interview, Prince refused to say that Frontier Services Group would not bid for any contract work that the proposal might create. Prince’s sister, Education Secretary DeVos, is equally interested in privatizing a piece of a large public institution—the education sector. 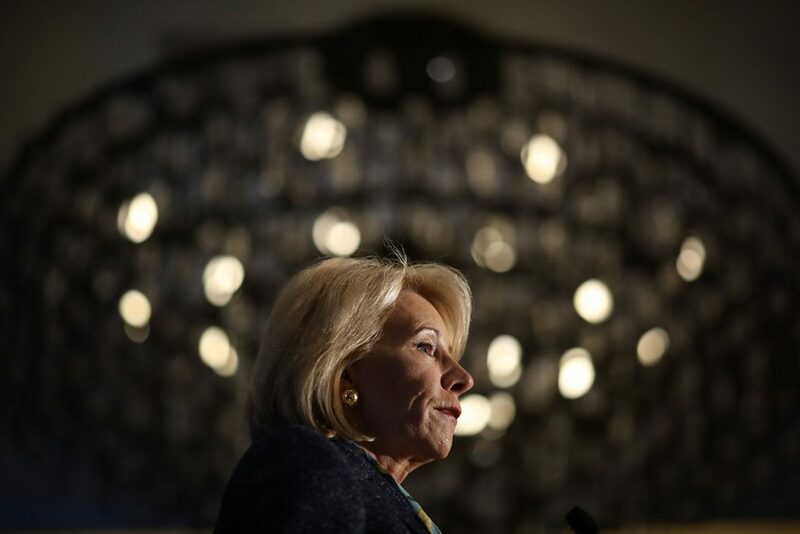 For instance, DeVos has pushed to move millions of dollars from Title I—a program that gives additional funds to the country’s poorest school districts—to a school choice program, including a federal system of private school vouchers. This would allow millions of public dollars to flow to a range of entities that do not answer to taxpayers, such as private schools and for-profit charter schools. Evidence shows that privatizing education hurts students and schools and that vouchers—which provide families with a fixed amount of public dollars to put toward private school tuition—specifically hurt student outcomes. A new CAP report found that being enrolled in a voucher program is equivalent to missing 68 days of learning and has a more detrimental impact on students’ achievement than other negative in-school factors, including school violent crime and teacher absenteeism. Both Erik Prince and Education Secretary Betsy DeVos have achieved considerable influence due to their massive wealth. Like many in the Trump administration, the two siblings are trying to use that influence to dismantle critical public institutions and siphon taxpayer dollars away from time-honored public services. The potential to save money or increase the efficiency of institutions is certainly appealing, and U.S. schools and military are not perfect. Yet, it is crucial that institutions continue to be part of democratic systems that are transparent and accountable to the public. Privatizing the military and public education does not improve outcomes and makes way for corruption. Americans shouldn’t privatize the institutions that they hold dear—our long-standing democracy is worth much more.